Abstract Four different strains of Saccharomyces cerevisiae yeast samples were irradiated using a 90Sr nuclear source. The results of this ongoing study reveal that the small irradiation doses used in the work reported here produce measurable changes in the fermentation parameters and in the lipid and phospholipid levels. Key words: Saccharomyces cerevisiae, small doses, fermentation. Yeasts are a growth form of eukaryotic microorganisms classified in the kingdom Fungi. Approximately 1500 species of yeasts have been described, most of which reproduce asexually by budding, although in a few cases by binary fission. Yeasts are unicellular, although some species with yeast forms may become multicellular through the formation of a string of connected budding cells known as pseudohyphae, or true hyphae as seen in most moulds. Industrial yeasts are of special interest for microbiology and biotechnology because they have a big content of lipids and phospholipids that are currently used in naturist products preparation. Nowadays, comprehensive research is being done with respect to the methods of obtaining lipids and phospholipids from lipid biocomponents, in order to identify new methods for obtaining liposomal substances, needed by the pharmaceutical, cosmetic and medical industry. At present, egg lecithin is being used instead but the use of this source has several drawbacks, such as for example the fact that it oxidizes easily. Eukaryotes (yeasts, fungi, algae) are the main microorganisms that produce lipids and phospholipids. Of great interest to microbiology and biotechnology are the researches conducted in the field of phospholipids synthesis, of obtaining phospholipids from microorganisms and of optimizing culture media for their cultivation. During the last decades, ionizing radiations have been investigated to determine their influence on living organisms. Radionuclides are released into the environment from various sources: nuclear accidents, as planned discharges from the nuclear power industry, disposal of radioactive waste, medical use, nuclear weapons development or recycling. Ionizing radiations are able to cause toxically and genetic effects on organisms, because radionuclides do accumulate in biotic and abiotic components of the environment . Nuclear radiation can stimulate morphogenetic changes manifest in the early development stages , . Nuclear radiation can directly disturb metabolic processes, such as photosynthesis, growth, plant respiration, active transport as well as ionic balance and enzyme synthesis . The literature reveals that low doses of ionizing radiations can stimulate cell proliferation , . In this study, we investigated the low doses of beta radiation influence on the four Saccharomyces cerevisia strings, mainly the influence on the fermentation process. The details of the samples irradiation and fermentation analysis are presented in sections 2 and 3. The samples were irradiated one at a time in an irradiation chamber that was build for this purpose. The hole in the upper part fits a glass tube than can be easily inserted and extracted. The tube is used to place the sample in the proximity of the beta irradiation source. The schematic of the irradiation chamber is presented in Fig.1. The dose debit through the glass tube, in the very location where the yest samples were placed one by one, was measured using a RFT – KD27012 dosimeter with an ion chamber. with the energies, branching ratios and half-lives presented in Table 1. The β energies, branching ratios and half-lives of the 90Y . Four strings of Saccharomyces cerevisiae yeast samples were used. The first string, labeled SCP, was separated from Turkish yeast having the trademark Pakmaya. The second string was labeled SCO and was separated from yeast having the trademark Dr.Oetker. The third string, labeled SCSL, was separated from French yeast having the trademark Saff Levure. The fourth string, labeled SCH, was separated from Dutch yeast having the trademark Hollandia. Both the control and the irradiated samples were cultivated in Malt Agar. Malt Agar is used for isolating and cultivating yeasts and molds from food and for cultivating yeast and mold stock cultures , . Malt Agar contains malt extract which provides the carbon, protein and nutrient sources required for the growth of microorganisms. Agar is the solidifying agent. The acidic pH of Malt Agar allows for optimal growth of molds and yeasts while restricting bacterial growth. The eight samples described above were subject to a fermentation process conducted in identical conditions, in an ECONOMY 20 fermenter. The temperature was maintained constant at 28°C. The acidity was maintained at pH=5.8. The maltasic activity (which is defined as catalysis of the hydrolysis of maltose by an alpha-D-glucosidase-type action) and the CO2 emission were monitored for 96 hours . 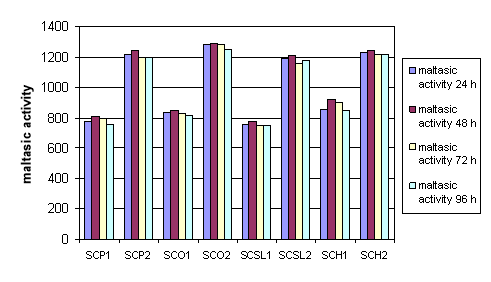 The results of the fermentation activity, measured as CO2 emission and the maltasic activity measured at 24 hours interval are presented in Table 3. The CO2 emission at 24 hours interval is presented in Fig. 2 and the maltasic activity in Fig. 3. Examining Table 1, Fig. 2 and 3 we notice that the fermentation process produced by the irradiated samples (batch having the suffix 2) is more intense, which is proved by the increased CO2 emission and by the increased maltasic activity. One of the efficient procedures to select high productivity yeasts is irradiating the samples with nuclear radiation. 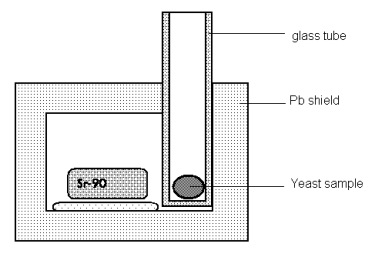 To our knowledge, results of β– irradiation on yeast have not been reported yet and the literature is poor in β– yeast irradiation . Examining the results we can conclude that for all four Saccharomyces cerevisiae yeast strings the low 12 Gray β– irradiation dosis had a stimulating effect in respect of the fermentation process. 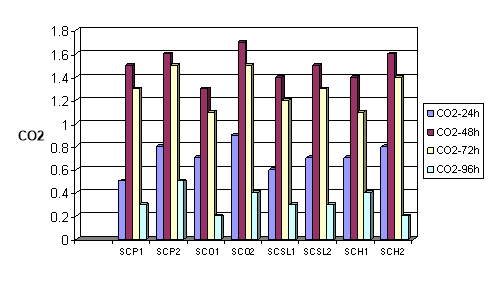 The SCO and SCH strings had the higher stimulation effect. We believe that the differences are produced by the yeast genome changes produced by ï¢– irradiation. V.I. Kryukov, V.I. Shishkin, S.F. Sokolenko, Radiacionnaja biologija. Radioekologija, 36, 209, (1996). I.W. Mericle, R.P. Mericle, Radiat. Botany, 7, 449, (1967). D. Chicea, M. Racuciu, Romanian Journal of Physics 52, 5-6, 589, (2007). V.A. Sidorov, Naukova dumka, Kiev, (1990). Conter, D. Dupouy, H. Planel, Int J Radiat Blot, 43, 421, (1983). F. Croute, J.P. Soleilhavoup, S. Vidal, S. Dupouy, H. Planel, Rad.Res., 92, 560, (1982). Ewing, Davis and Reavis, Public Health Lab. 15, 153, (1957). MacFaddin, Media for isolation-cultivation-identification-maintenance of medical bacteria, vol. 1, Williams & Wilkins, Baltimore, (1985). H. Kuriyama, W. Mahakarnchanakul, S. Matsui, H. Kobayashi, Biotechnol. Lett., 15 (2), 189, (1993). J. Kiefer, M. Ebert, Biophysik., 6, 3, 271, (1970). "Low Β- Irradiation Doses on Saccharomyces Cerevisiae." UKEssays.com. 11 2018. All Answers Ltd. 04 2019 <https://www.ukessays.com/essays/physics/low-irradiation-doses-saccharomyces-3428.php?vref=1>. "Low Β- Irradiation Doses on Saccharomyces Cerevisiae." All Answers Ltd. ukessays.com, November 2018. Web. 20 April 2019. <https://www.ukessays.com/essays/physics/low-irradiation-doses-saccharomyces-3428.php?vref=1>. UKEssays. November 2018. Low Β- Irradiation Doses on Saccharomyces Cerevisiae. [online]. Available from: https://www.ukessays.com/essays/physics/low-irradiation-doses-saccharomyces-3428.php?vref=1 [Accessed 20 April 2019]. UKEssays. Low Β- Irradiation Doses on Saccharomyces Cerevisiae [Internet]. November 2018. [Accessed 20 April 2019]; Available from: https://www.ukessays.com/essays/physics/low-irradiation-doses-saccharomyces-3428.php?vref=1.